During veggies at bedtime last night, I noticed a large bloody patch underneath Winnie’s ear. It was absolutely horrific looking. She is white and her whole ear and about an inch of hair underneath was stained bright red. I tried to clean away some of the blood to see what was going on. A connecting part of her cartilage was completely detached from the earlobe and there was a chunky bloody mass. I cleaned as much as I could and we ran to the emergency vet. He gave it a good clean with antiseptic and washed with a needle syringe. 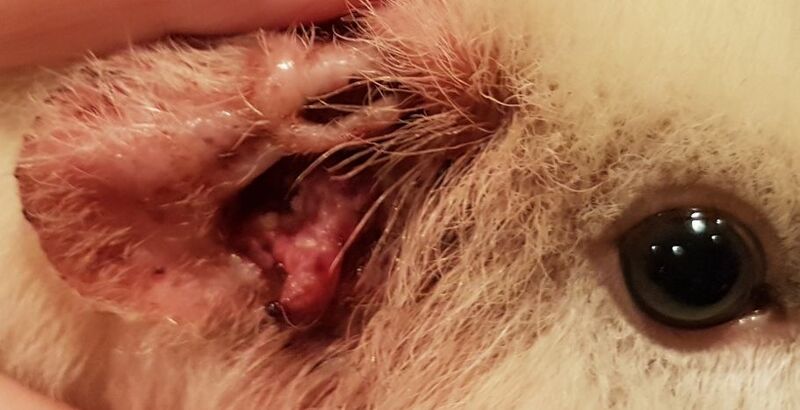 He thinks it is a burst cyst or abscess as the chunky tissue in the middle of the ear had some white spots on it. He thinks the little piece of cartilage must have detached when it burst. 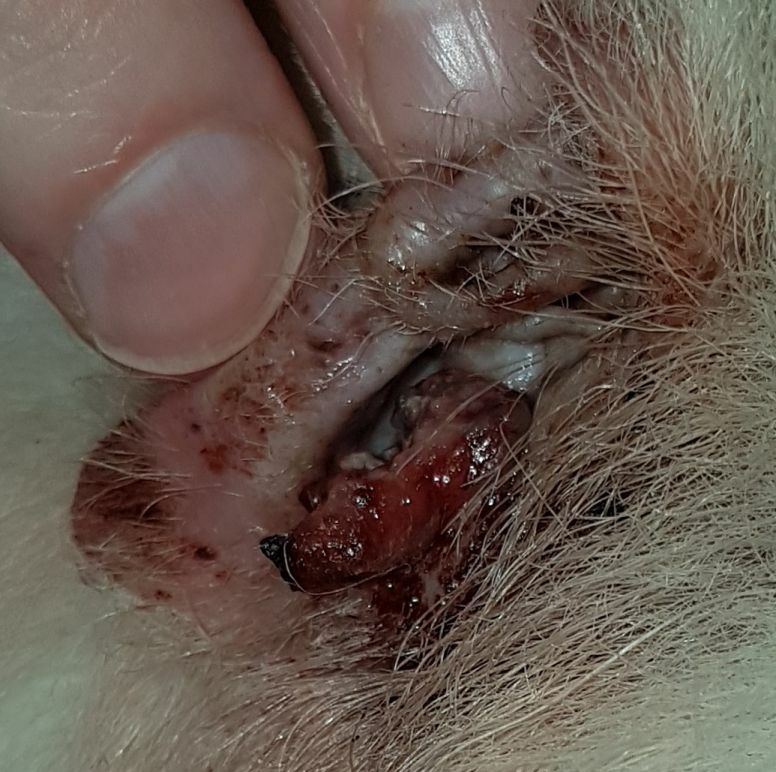 He gave her a shot of Metacam and told us that it should stop bleeding but to keep an eye on it for infection and to take her to the regular vet after a few days to give it time to crust over. She seems 98% herself last night and this morning but when I woke up this morning, it looks like there is some fresher red blood on her fur. I’m panicking because the vet said not to touch it too much so that it can heal and scab over, which I agree with but the sight of the blood is making me panic. Winnie is about 5 yrs and I really don’t want to get overzealous and start performing surgeries and procedures on her, especially as she is eating, drinking and doesn’t seem bothered by it. I’m worried about her losing blood and going into shock. All her vitals last night were fine. I want to at least give the fur a clean so I can measure the level of blood/seepage but I am wary about disturbing the area and opening up any healing scabs. It looks horribly stained but I am not sure if it is worse because of her white coat. This is like some freaky stuff. I check them regularly but I have been caring for my sick dog for the last week so it has probably been a week or two since I looked in her ears. I think I agree with the vet but I am questioning what to do. Any advice is very welcome. Thank you. Generally, any wound on a guinea pig is kept open by flushing so it can heal from within. Otherwise, they tend to scab over, fill up with pus, and burst again. Was this a vet experienced in treating guinea pigs? If not, I'd get her to a good exotic vet ASAP and let him evaluate the situation. One very common problem with guinea pigs is cervical lymphadenitis, which occurs in the lymph nodes in the neck and can cause rupture. But it needs treatment with an antibiotic. Is there any chance that it's an injury rather than a burst cyst/abscess? Another pig in the cage? Any rough area in the cage where she could have torn it? Thanks for your reply. Our usual exotic vet was not available so we saw a regular vet. He seemed pretty thorough, though. I might call our exotic vet and see if she is available today. I think the intention to not sluice it was to help the bleeding stop. I don’t know. I’m terrified. I'd want an exotic vet to see her. I am going to guess that guinea pigs have a pretty fair blood supply to the ears - you can see them get red when they are hot and/or trying to dissipate heat. So depending on what happened, excess bleeding (at least initially) might make sense. I wonder also about an injury. Can you send a clear crisp photo of the ear and the location of the bleeding? We took her to our exotic vet today and she thinks it is a growth. We have booked Winnie in for an operation tomorrow at 10am. I can’t stop crying. I don’t know how I missed this. I check their ears all the time. It looks so much worse today. I took some photos and I will upload them but I’m ashamed. They look so bad, it looks like she has been neglected. 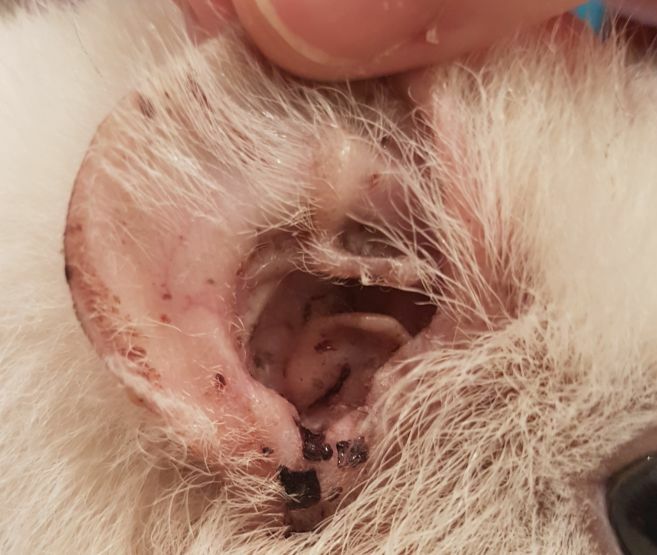 I think the growth must have been connected inside, though, and somehow came loose when it started bleeding because the vet said the tissue at the bottom of it is thick and when they have been cleaning the ear out, they have been pulling this growth outwards to the point of it looking like a finger sticking out. In 13 years of keeping guinea pigs, I have never seen anything like this. I’ve looked at the other ear threads in Guinea lynx but nothing looks like this. So, hopefully some good can come out of this once we find out what is going on, what exactly the growth is and I can upload the gruesome photos. I don’t know if she will survive the surgery or the recovery tomorrow. I’m praying she will. She is acting totally normally and seems in good health otherwise. I don’t understand how something can come up out of nowhere like this and start haemorrhaging. If we don’t operate, the chances are she could bleed out at home, according to the vet. Last edited by defairmans on Mon Oct 15, 2018 3:32 pm, edited 1 time in total. By the way, Lynx, you may know this, but, the vet said that pigs can lose a ml of blood per 100g. I can’t believe that. I thought it might be an injury at first. Maybe her boar partner, Dandy caught a sensitive part during grooming but, no, there is too much bloody tissue in there to be an injury. Even thought for a minute it might be a burst eardrum. I'm wishing you and her the best of luck. Please keep us posted on how you both are doing. We wish you the best of luck on the surgery tomorrow. I wonder if the vet will do an cauterization (I believe this would burn/seal a blood vessel to prevent bleeding). I am sure your vet will do their utmost to care for your guinea pig. Pictures will be appreciated. It will help us understand what is going on. I would not criticize yourself for not catching it. Growths can grow quickly. We have all missed something. I'm sending as much good luck as I can. Please don't beat yourself up. Something like this can hide in ear wax very easily. Follow the post-op care link and she'll have a good, easy recovery. Do keep us updated. Here are your photos. They are very crisp. I am thinking a polyp of some sort. What did your vet think, after removing it? Thanks Lynx! Winnie came through the surgery very well. The last pic is the day after the surgery. It looks even better now! The vet said it is a common growth for pigs but usually occurs on their backs, a TRICHOFOLLICULOMA, I think she said. The good news is that it was begnign but because it was so far in, she couldn’t remove all of it and be confident of a margin of growth. It may grow back because she couldn’t get to it all but hopefully, we have bought Winnie some time and it doesn’t grow back too fast. She recovered exceptionally well. They kept her in over night and she was eating and drinking as soon as she came home. She is on Bactrim until this Friday. I think it must have been tucked inside her ear and burst. It was very smelly after it burst. I can upload a photo of a week after surgery if wanted but it looks just like a normal ear now. So glad to hear the surgery went well and that the growth was benign. A final photo, if you have one, would still be great! I am so glad the surgery went so well. Hoping it does not come back. I have an update on Winnie. I also have a very clear two weeks post op photo of her ear, which I will send to Lynx to be posted. She has been doing amazingly well until Fri, which was about two and a half weeks post op. We came home and I noticed a slight head tilt. Both of her ears were bright red (but she is pale coloured). I took her straight to the emergency vet. Of course, once we got there, her head tilt seemed slightly better and her ears had calmed down. She had no temp and vitals were ok. Vet thought her left side jaw was slightly thickened. The growth could be growing into her skull or jaw already. Vet said we could X-ray her but most outcomes of that would involve very invasive surgery that she may not survive. I’m afraid she doesn’t have much time left. We started her on flagyl, metacam and ranitidine in case it is an inner ear infection. The next day, there was no sign of a head tilt and she was acting completely normally. I gave her the nighttime meds and she seemed puffed out for a few hours afterwards but still begged for veg. This morning, she is not interested in pellets and has retreated back to her cuddle cup. She does not seem herself at all. She is due her morning meds now but I feel horrible giving them to her as she hates being syringed and it seems every time she gets the meds, she gets low. I have accepted that she probably doesn’t have long left with us and we will do what we have to do if her quality of life suffers. What do you guys think I should do? She’s only had three doses of this cocktail of meds, was fine yesterday and now she is looking sad! Our vet is only in Mon and Tues and then goes away for a week. Any advice is welcome. Thank you. She may just be reacting to the meds. Did you give her a probiotic after the flagyl? However, I've never heard of flagyl being given for a possible ear infection. I am sorry to hear she is not doing well. Perhaps another antibiotic? I believe an xray would show if there is an infection present within the ear. p.s. I added spaces between some of your paragraphs. It will help with readability if you add spaces between paragraphs. I, too, hope it's just a reaction to the meds. Don't forget to give a probiotic 60-90 minutes after the antibiotic. Don't give up the fight until you have to! (That doesn't mean you need to ignore her quality of life, though.) Hang in there. We're thinking good thoughts! Thank you everyone. I am giving her Fibreplex three times a day but I have been giving it the same time as the antibiotic. I will switch to after now. Sorry for the formatting, Lynx. I go a bit manic when I am anxious. I really hope it is the meds. We are definitely going to keep fighting as long as she fights. I just don’t want her to suffer. I gave her a few syringes of Crit Care this morning after she didn’t want the pellets, which she seemed happy to take. She then went and had some hay. She seems a bit more perky this afternoon, eating hay and drinking a little but she has gone back to sleep again. The vet mentioned anaesthesia for the X-ray but I am going to call tomorrow and see if we can do it without. I don’t see why not. She indicated any results would likely be showing something bad and bar surgery, the care would be palliative. I am thankful for any extra day she has, especially without pain. If she is dying/in lots of pain, I feel bad constantly poking her with syringes multiple times a day. I’ve nursed two pigs in the past for a month each time only to lose them and I feel very conscious about quality of life.